Got someone on your shopping list who loves crafting & DIY projects? Or maybe that person is you, in which case you should share this gift guide with your friends & family immediately! If they're anything like me, they haven't started shopping yet and could use some ideas. 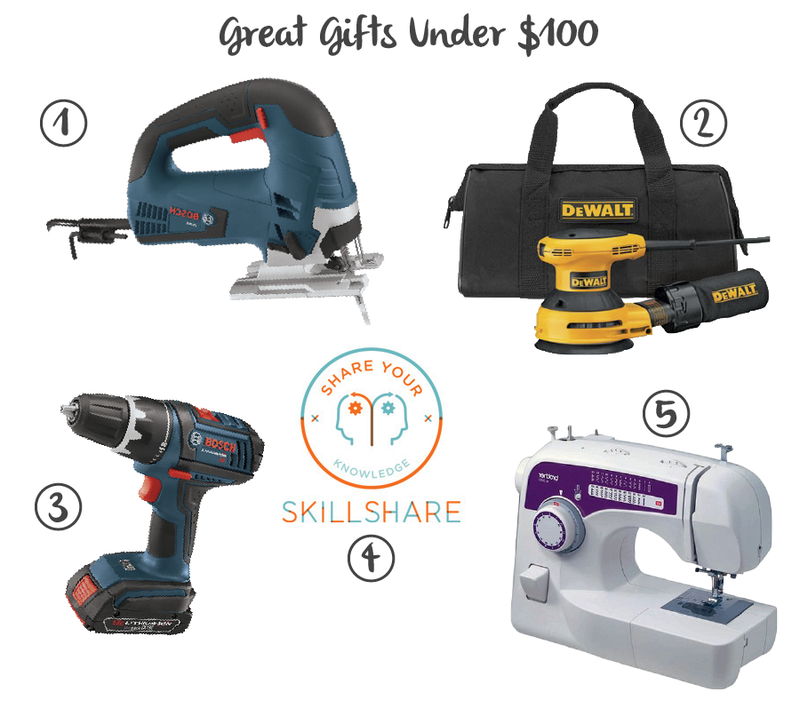 All of the items on this list are either things I have & love or don't have & want, in all cases I think any die-hard or aspiring DIYer would appreciate them. In my family, we stick to Secret-Santa-style giving, so I only have 1 person to shop for, and I'm legally prohibited from spending more than $50. Yes, LEGALLY – the Secret Santa Police fly in on reindeer and tie you up with tinsel if you go over budget or spill the beans about who you're buying for. As a result, I think of potential gifts in terms of cost...what can I get for less than $20 or $50 or $100 (if you aren't in the Santa Police jurisdiction)? I've organized my list by those guidelines and did my best to provide links to these products on Amazon so Amazon Prime members can take advantage of free 2-day shipping. Most of the other items are available in big box stores, so you can run out and grab 'em if you don't want to gamble with shipping. Let me know what you think of my picks in the comments! Anything you would have included that I missed? I was gifted a couple Moleskines for my birthday and love having them in my bag so I can scribble down thoughts & project ideas. They come in different colors and options, but the dotted pages are particularly great for sketching floor plans and building projects. Push pins are so passé – the cool kids use washi tape to put their ideas & pictures on the wall. A quick pinterest search will pull up tons of other creative uses for it too… Washi comes in countless colors, sizes and patterns, but this set of 4 designed by the sister duo at A Beautiful Mess is really adorable. This is one of the few items that I'm unsure of in terms of shipping, so check that out before you get your heart totally set. Cutting hundreds of isosceles triangles for a garland is way more fun when your scissors are blingin'. These puppies are so cute, you’ll wanna leave 'em on your desk instead of in your junk drawer. Now that I have an entire wall of shelving I am all about hardcover books, so I included 4, count ‘em, FOUR books this holiday season that I’d love to have and read. Prices vary between hardcover, paperback, kindle, and audio cds, but they’re all $20 or less and eligible for Amazon Prime. The story of a woman who built an 84-square-foot house from the ground up by herself in the Pacific Northwest. Um, helloooo! Woman power! I fantasize about designing & building a house some day & I love the tiny house movement, so this one is a no-brainer. I can’t believe I don’t have this book yet... YHL was the blog that inspired me to start recording my home adventures (thank you Sharon for turning me onto them). 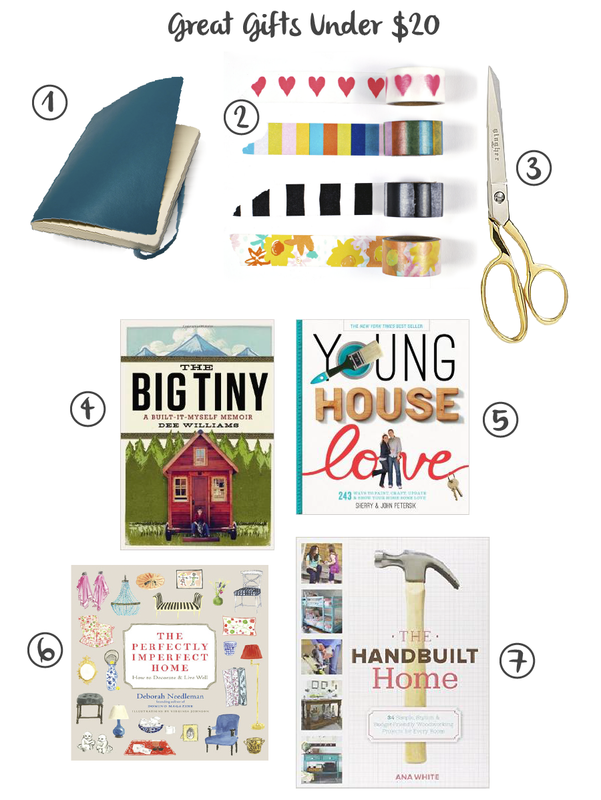 Their book is chock-full of fun, budget-friendly ideas for DIYers of all skill levels. The founding editor-in-chief of domino magazine, aka the Rosetta Stone of home styling, shares her secrets for creating a relaxed, stylish and comfortable home. She's all about decorating your home to fit your lifestyle, not the other way around. I am so inspired by Ana White – this lady can build anything! Her book has 34 build-it-yourself furniture guides and the information you need to know so you can become a master woodworker too. You know what they say about giving a man a fish and teaching him to fish. Her blog is also a great resource for anyone looking to build some designer-looking pieces. I bought the smaller version of this toolkit years ago and still use it almost every day. This larger version looks better to me because it has a level, needle-nose pliers, and some other things that I have but can never find at the bottom of my tool drawer. Perfect for people who don't have a lot of space to store tools because most of what you need can live harmoniously in one container. I don't have a lap loom but I wish I did! This is perfect for making those wall weavings that have been all the rage lately. Jigsaws are useful if you need to cut out shapes or cut along a curve (headboards & side tables come to mind). This is your detail saw... good for someone who wants to get into more advanced DIY projects & already has the basics. Y'all know how I feel about the orbital sander by now. It's way more powerful than the Black & Decker Mouse sander AND it's dust collection bag works well. If you've got a mega-dust situation on your hands, you can also attach it to a mini-vac. OK, so this one is cheating. It's not under $100, but it is by far the most useful tool a gal (or guy) could have. You'd just need a 16% off deal to be in the clear, and I have a feeling lots of retailers are still running holiday sales! The Secret Santa Police don't have rules against coupons, friends. When Eli insisted on getting this drill I thought, "how could this possibly be that much better than the drill we have? A drill is a drill, right?" WRONG. This drill/driver is wayyyyyyy better. It's more powerful and the battery lasts longer, so it works when we need it to. Who doesn't love the gift of knowledge? Skillshare seems like a very cool platform for learning new skills, and you don't have to commit to a year to sign up. I've loved sewing since I was a little girl watching my mom make dresses for all her girls. I've been meaning to get my old machine repaired, but it may be more economical to just get a new one. This would come in handy for making pillowcases, bedskirts, curtains, clothes...you name it. I hope this guide was useful. Let me and other readers know in the comments if I missed something!